The Casio G'zOne Brigade is the toughest phone you can buy with a full QWERTY keyboard. It's waterproof and shockproof, but still packs plenty of Verizon Wireless' 3G multimedia features. 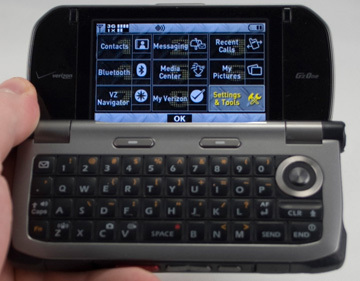 The Casio G'zOne Brigade is the only phone available from a major U.S. carrier that gives you a full QWERTY keyboard to send text message from the beach . . . while surfing. It's built like a tank, and almost as large. Because it's so durable, and practically alone in its class, it's easy to forgive some shortcomings. Apple today revealed the Apple Watch Series 2, a new version of its wearable. The Watch will ship with watchOS 3.0, which adds a number of new features. My dad actually has been using 2 type-s (one for work and one for personal use) since release and they have been amazing considering he works in consturctual steel (actually backed over the one with his semi). The past few g'zone models have been a little disappointing and finally we get something worth having. I mean is it water proof or splash proof? Can you just put the thing under water and just start recording underwater activity?